These are just chocolate sponge cupcakes, topped with pale blue icing. The butterfly wings are made from melted chocolate set on greaseproof paper in the shape of wings. when set, these are gently pressed into the icing, and decorated with more coloured icing. Pink food glitter was sprinkled on top. 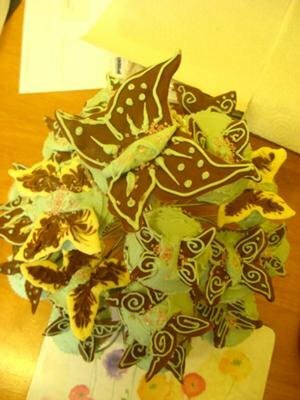 Click Here For Butterfly Party Ideas!